The vast terrain between Panama and Tierra del Fuego contains some of the world’s richest mammalian fauna, but until now it has lacked a comprehensive systematic reference to the identification, distribution, and taxonomy of its mammals. The first such book of its kind and the inaugural volume in a three-part series, Mammals of South America both summarizes existing information and encourages further research of the mammals indigenous to the region. 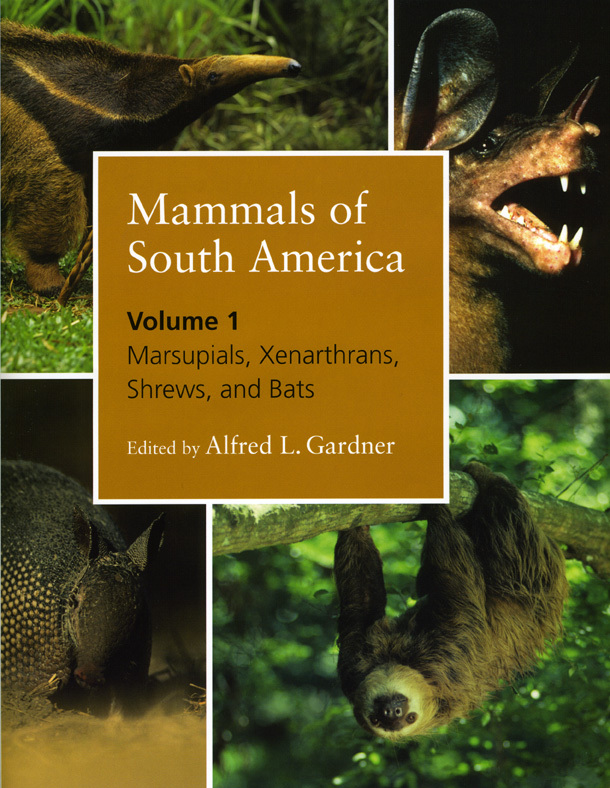 Containing identification keys and brief descriptions of each order, family, and genus, the first volume of Mammals of South America covers marsupials, shrews, armadillos, sloths, anteaters, and bats. Species accounts include taxonomic descriptions, synonymies, keys to identification, distributions with maps and a gazetteer of marginal localities, lists of recognized subspecies, brief summaries of natural history information, and discussions of issues related to taxonomic interpretations.Highly anticipated and much needed, this book will be a landmark contribution to mammalogy, zoology, tropical biology, and conservation biology. "This volume is the first of three to address the taxonomy and distribution of the South American mammal fauna. It is dense with information written by 37 contributors and marshaled into an organizational triumph by editor Gardner....This book is an outstanding example of a reference meant especially for researchers in the fields of mammalogy, vertebrate taxonomy, and vertebrate ecology. It does for South America what The Mammals of North America (whose format it resembles), by E. Raymond Hall (2nd ed., 1981), did for North America." "Over a quarter of a century in development, this is the first of three volumes intended to provide a contemporary and comprehensive taxonomic coverage of the mammals of South America. Gardner and 36 colleagues have provided not just a benchmark, but likely THE contemporary benchmark in Neotropical mammal biology. . . . If the first volume is any indicaion of what’s coming, then it appears that South American mammals are finally getting the synthesis they deserve."